Medical Director of the Felix Platter Hospital. Primary Investigator for the Swiss Power Centering for Seniors research. Reto W. Kressig is Professor and Chair of Geriatrics at the University of Basel, Switzerland. He is Chief Medical Officer and Member of the Board of the University Center for Medicine of Aging at the Felix Platter Hospital Basel. His scientific work and interests include older adults' gait biomechanics, physical activity, functional autonomy, nutrition and cognition in relation to principles of geriatric rehabilitation and fall prevention. Prof. Kressig is author of more than a hundred peer-reviewed original articles, numerous book chapters and other miscellaneous publications. He is Editorial-Member of several international geriatric journals, including JAGS (Journal of American Geriatrics Society). 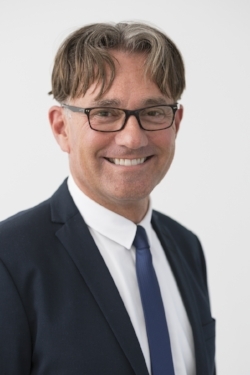 Prof. Kressig is Associate Professor of Gerontology at the University of Luxemburg and former Board Member and Secretary of the European Academy for Medicine of Aging. Project Director for the Legacy of Wisdom Swiss Association. Acts as liaison between the institutions and is responsible for overall intervention development and testing. Jay Goldfarb is the founder and director of the Legacy of Wisdom Swiss Association. Born in New York, he undertook his graduate studies at SUNY Albany. In 1976, he co-founded the Living Tao Foundation and was its director until 1991. Simultaneously, from 1982 - 1986, he was Dean of the Lan Ting Institute at Wuyishan in China. Moving to Switzerland, he founded the Swiss branch of the Living Tao Foundation in 1987. Goldfarb has served as the Executive Director since then. Additionally, Goldfarb was a senior management consultant with American Express internationally between 1992 and 1997. In 1992, he joined the Waldhaus Foundation as a crisis manager and with his guidance and a dedicated team, it was transformed into a successful European seminar center. Since 1996 he has been Executive Director of the Waldhaus Foundation. A professional congress organizer, he is a senior member of Meetings Professionals International (MPI) - the largest association of meeting professionals in the world. He has been researching and teaching Tai Ji and meditation in addition to his business work for over 40 years. In 2009 Goldfarb began his venture into working with senior citizens and dove into closely associated medical research to increase mobility and reduce falls in seniors. Director, Basel Mobility Center. As laboratory director, she is responsible for the scientific testing, assessments and data analysis for the Swiss research arm. Tao Arts Institute Director in Basel, Switzerland. Intervention Director. Responsible for the development of the curriculum and teacher training for the program. Ursula de Almeida Goldfarb is an EMR-ASCA recognized therapist for medical Yi Qi Gong, Tai Ji, Qi Dance, and foot reflexology, while also maintaining her career as a professional dancer. Her work lies at the nexus of dance, performance, western and eastern medicine and therapy. In 1972 she received her certification in gymnastic and dance pedagogy and eutony. Under H. Marquart’s tutelage, she received her diploma in foot reflexology in 1975 and studied dance therapy with Trudy Schoop. Thereafter, she also completed studies in craniosacral therapy with Dr. A. Arnold (Sphinx). De Almeida Goldfarb worked as a teacher at the School for Gymnastics Schwarzerden and at the Carl Orff Institute in Salzburg. She was employed at the psychiatric clinics Königsfelden and Hasenbühl. Afterward, she collaborated with Dr. G. Knöferl as a co-therapist in bioenergetics and dance therapy. She was also a co-therapist with Dr. I. Jahrsetz (holotropic breathwork by Dr. S. Grof) for 20 years. Concurrently, she contributed to the training doctors and therapists under Dr. J. Bösch at the Bruderholz Hospital in Basel as their Yi Qi Gong instructor. Since 1975, de Almeida Goldfarb has devoted herself to her practice in Qi, Qi Gong and Tai Ji in China, including trainings with Dr. Li Zhi Chang. Additionally, she studied Traditional Chinese Medicine and Acupuncture under Dr. G. Fisch and Dr. Hp. Braun and completed the ATMA certification. Director, Boston Claude D. Pepper Older Americans Independence Center Brigham and Women’s Hospital. Was chief investigator for the 2014 program. Division of Endocrinology, Men's Health, Aging, and Metabolism. Was responsible for the functional strength training protocol used in the 2014 program.